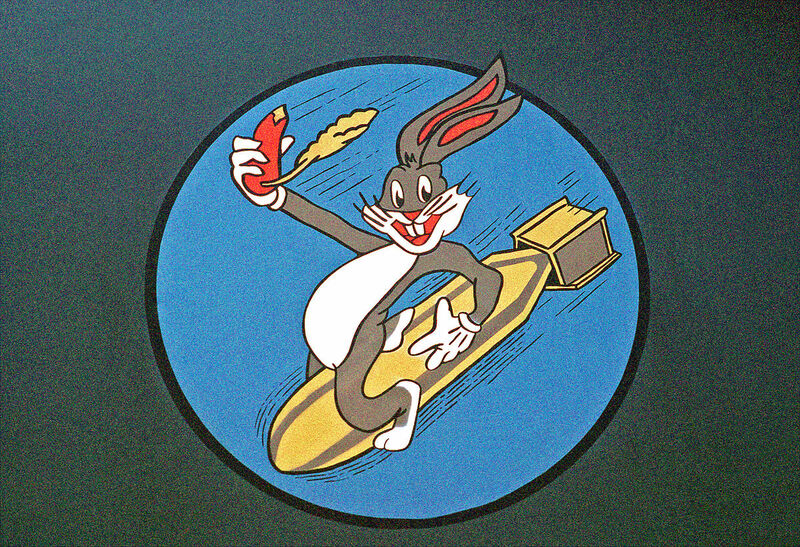 A youthful Bugs Bunny appeared as nose art on many Allied planes in World War II. Bugs Bunny is, hands down, my favorite cartoon character of all time. For as long as I can remember, I have admired his casual confidence and ability to be unfazed by any situation. 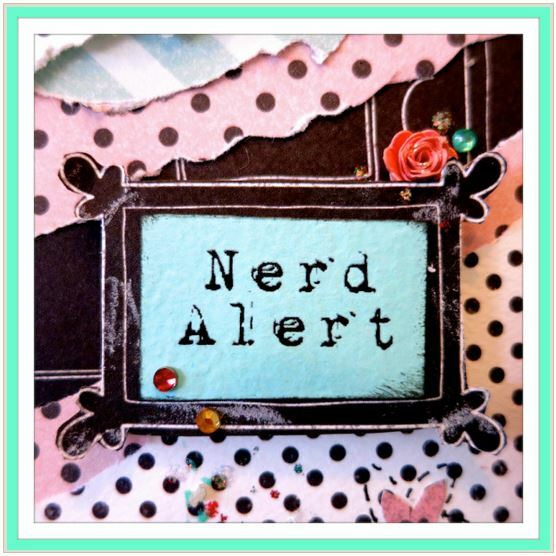 He’s a lovable smart aleck whose wisecracks manage to be congenial rather than combative. His irrepressible personality must appeal to a lot of other people, too, because he’s the 9th most portrayed film personality in the world, according to Warner Brothers. He’s even a veteran of World War II, having been named an honorary Master Sergeant in the Marine Corps, and the official mascot of Kingman Army Air Field in Arizona, where Clark Gable and Charles Bronson were among the trainees. Bugs showed up as a mascot for a number of other military squadrons, decorating the noses of aircraft. Though his personality is relaxed, good-natured and mostly passive, his ability to outwit Elmer Fudd (or anyone else who had it in for him) sends a clear message: don’t mess with me, or your aggression will backfire. Bugs moves through his world with a detached curiosity, inquisitive without ever being drawn in by any attempts to sabotage him. But he doesn’t take himself too seriously, and when he’s wryly amused at the foolishness of others, he cuts his eyes towards us with a conspiratorial expression that tells us he knows we are in on the joke. Bugs is still going strong at 75, which should be an encouragement to those of us who are getting closer to that milestone. He is an amusing illustration of the truth behind the old saying that those who laugh, last. Thank you Cherie. I’m so glad you liked the post! In Matt’s bathroom there is a cartoon picture of Bugs holding a toothbrush (the way he normally holds a carrot) and a word balloon that show us he’s saying “Brush up, Doc!” 😀 Sending you cyber hugs! Bugs Bunny and all his co-harts in crime, were a collection of people’s personas, stories of childhood and reflections on the times at hand. It brought a room full of people, adult & kids, together in laughter. I recall the times my dad and uncles would sit around and watch together all of us laughing as if we were all 7 years old . Great memory Julia! Thanks Steve, I’m so glad you enjoyed it! Weren’t we lucky to grow up with a feisty little cartoon character like Bugs? No matter what he got into, he always seemed to get out of it with a smile and none the worse for wear. It’s nice to hear from you — hope you are doing well! Wow, Merry, you and Bugs really did grow up together! In some ways old Bugs may not have been the best role model for us, but we could do much worse than adopt his happy-go-lucky attitude toward much of what we tend to take too seriously. For some people when they are pressed a lot, some very old anxieties are risen, and laugh may not come easily. But even then they may think of their best times and a smile will appear. They should be grateful for these times and get courage to carry on smiling. I agree! Gratitude and laughter can get us through many tough times. Thanks for your comment here. Well that’s news to me. I didn’t watch much TV most of my life so had no idea that Bugs had been around so long. Nor that he played such an important part in the war. My goodness. I lived a very different childhood from the rest of you. I’m always the odd duck. Moving around so much and back and fourth to Germany. We were not allowed inside except to clean, eat and sleep. I didn’t start watching TV until I had children except for the odd occasion. I rarely went to movies either. That’s why books are my friends. Libraries were my safe haven. Marlene, I think you may not have missed much by going without television, although my bias is that TV was better many years ago than it is now. I do remember that we were rarely allowed to play indoors, especially with friends, but were expected to play outside unless the weather was bad. I think moving is tough enough on children without changing countries and languages. As a military family, our kids had to move and change schools frequently, but never had the language barrier to deal with. I like to think they gained more from all those moves than they gave up, but there is no question that it is difficult. And yes, I think books are important to many kids who move often. I know they always were to our sons. I will agree that all the moving was hard, but made me a more adaptable person. I truly feel sorry for people who have been in the same place their whole lives. Mine has been exceedingly richer for it. I learned to turn inward rather than outward for verification. I was brought up with both languages in the beginning. More German than English to start, then more English and very little German. So sad that my parents chose to stop use of German in our home. I could have benefited from it. Did you move a lot as a child too? No, I was very young (or not yet born) when my family did most of their moving. In nine years my mother had four children in four different states, but from the age of six, I lived in the same house that my parents stayed in until the mid-eighties. Because of the airline connection, I did travel quite a bit, but it’s not the same as living in new places. Learning two languages would be an even bigger asset. I was amazed and envious at the bilingual fluency of many of the kids who used to come to my programs while I was a youth services librarian in California. These kids spoke English without a trace of an accent, but most of them spoke Spanish at home and were totally fluent in it as well. They were excellent at translating for me! Well, Bugs Bunny has received much publicity regarding his 75 years ago debut. Of course, I read it here first. 😉 I laughed seeing the “I should have turned left in Albuquerque” collection, which I’d forgotten about. I suppose that supports the theory that men don’t stop to ask for directions. This was fun and informative for our Monday. If you see me on the Verandah, I’m probably looking for some Raynard Cake crumbs, especially those caramel ones! Too yummy! One of the grand things that happens for people of advanced age, octogenarians like me, is recalling occurrences of quite long ago. Yesterday was the 75th anniversary of the release of the first cartoon of Bugs Bunny and I have watched it and reveled in it this morning and swanny to goodness my recall is some of my buddies and I saw it on its first run in July 1940. If this didn’t actually happen it wasn’t long before Bugs was a frequent visitor on our local silver screen. I’m pleased that the childhood enchantment was revisited this morning. WOW Harry, you were there from the beginning! I’m guessing your memory is correct. I’m glad someone else remembers seeing Bugs at the movie theater. He shows up well on the big screen and was way more fun to watch than the long strings of commercials they have the nerve to show in theaters today. I’m so glad you enjoyed re-visiting those bygone days. Thanks for info about the great Bugs that I never knew. My favorite cartoon is the one about the opera, with he and Elmer Fudd starring and singing. Alan, I don’t remember that one; I need to look it up. I’m sure it must be posted somewhere on YouTube. I love Bugs Bunny, always have! How sweet of you to feature him on your blog. I didn’t know most of what you shared. He deserves his own biography or movie or both.